The sky is a very heavy thing. It is held by a man-made structure ending up on a chair with multiple legs. People live under this gigantic chair that should never be moved. Their daily job is holding the chair legs. The schedule is kept religiously. This is a tightly-knit community surviving with the knowledge one’s mistake will be fatal on everyone. The mantra of responsibility and commitment to the all encompassing goal of constant salvation is reiterated daily. If anyone’s feet go shaky, if they lose their grip of the chair, the world will fall apart on their heads. Helping out someone during her shift is a deviation. No one wonders about the condition they are living in. No one questions it. Or almost. In the past there have been one or two cases of people voicing some concern but no one really knows what happened to them. Parts of the heavy sky fell on them, that must be it, surely. In one of the workrooms a GIRL is not so sure they know the truth. She dreams of what owning your arms and legs must be like. She (GIRL) questions the condition they live in. Why do the hands and legs of the people have to belong to someone outside themselves? Her grandmother(WOMAN) is worrying over her granddaughter’s sudden awakening and tries to talk sense to her. But the girl is determined to spread the word. After them there will be more people living like this. They should get to know there are possibilities to live differently. A father(MAN) is worrying over his son’s (BOY) future in the given regime of slavery. Looking at his son (BOY) holding a chair leg and beginning his shift overwhelms him. What he used to dream of when his son was a baby was so different to this. Can his son fit in this world? A man in power (MAN ABOVE) is worrying over his losing authority. He can feel something is moving, about to change and it must be what people are thinking. He needs to find a way to turn the situation around to his benefit. Born in Greece, she studied Writing for the Stage and Broadcast Media at the Royal Central School of Speech and Drama, University of London. 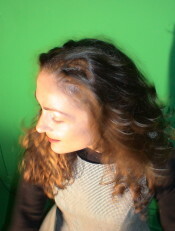 Her plays include Cows, (Theatro tou Neou Kosmou, Athens, 2007), Rebirth (Heraclion City Walls, Crete, 2009), New Dad (Battersea Arts Centre, London, 2010), Mammal, love, (staged reading by the Factory Theatre, 2010) and scripts for Dimitris Fotiou’s online works Dystypia and This is Your Home Now and Roof (Festival of dramaturgy on the crisis PIIGS 2014). In 2006 she was awarded the Greek Ministry of Culture 1st prize for writing Where Liromions Grow, a play for children. Published work includes two poetry books (Mandragoras Publishing House, 2008 & 2013).